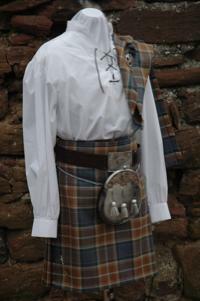 The Jacobite shirt is usually worn with the kilt to give it a casual look. They range in quality from one hundred percent cotton or alternatively one hundred percent linen, down to one hundred percent polyester (ugh who would want a plastic shirt?). They are usually designed to look like a shirt that would have been worn during Scotland's Jacobite period (1685-1750). But in truth there is no evidence that these shirts truly represent what was being worn at that time. They are simply a modern representation of an ancient shirt, which somebody decided to give a period name to. 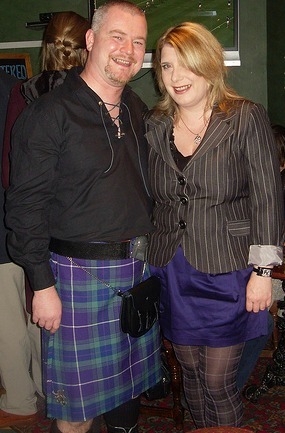 Having said that they do give the kilt a very stylish casual look, and they are very comfortable to wear (so long as you don't opt for the plastic version). Below you can see a photo of one of these shirts, unfortunately on a manikin and not a real person. They are longer than a conventional shirt, which is quite practical if you don't wear anything else under your kilt. They are cut very generously not only in the body but the sleeves are also puffed, which gives freedom of movement. You can see a darker colour shirt being featured in the photo below, this time being worn by a real person. That real person wearing the shirt is David Paterson, founder and chairman of the Hawick Highland Games. These shirts are laced at the collar usually using a leather thong, one sign of a good quality shirt is that the holes for the thong should be stitched rather than riveted. And quality horn or wooden buttons are used on the cuffs of the better quality shirts. In the next photo you can see a black version of the shirt, being worn by a young man who is obviously enjoying being in the company of the young lady. You can also find them being made without a collar, which they call a grandad collar and instead of a leather thong you then have buttons. They are available in a wide range of colours to compliment the tartan of your kilt, but my personal choice would always be a cream colour, as that would contrast with almost any tartan. Looking after your shirt would usually mean washing it on a gentle cycle, the cotton will have been hand shrunk before the shirt is made, so to ensure it doesn't shrink further in the wash, don't wash it on a hot cycle. So all in all these shirts come in a wide range, and you should be able to find one to suit your taste if you want a comfortable casual look to go with your kilt.